Few, if any, raids could have had a greater impact on the outcome of the Second World War than the one carried out in 1943 by a small group of saboteurs from the SOE against the Vemork Norsk hydro-electric plant in Norway. The raid, later immortalized on screen in the 1965 film Heroes of Telemark, was to sabotage the plant and so prevent the Nazis from acquiring deuterium oxide, otherwise known as heavy water, which could have been used in the production of nuclear weapons. It has since been described as the SOE’s greatest raid of the war, but, had the raid not have been successful, the outcome of the Second World War might have been quite different. 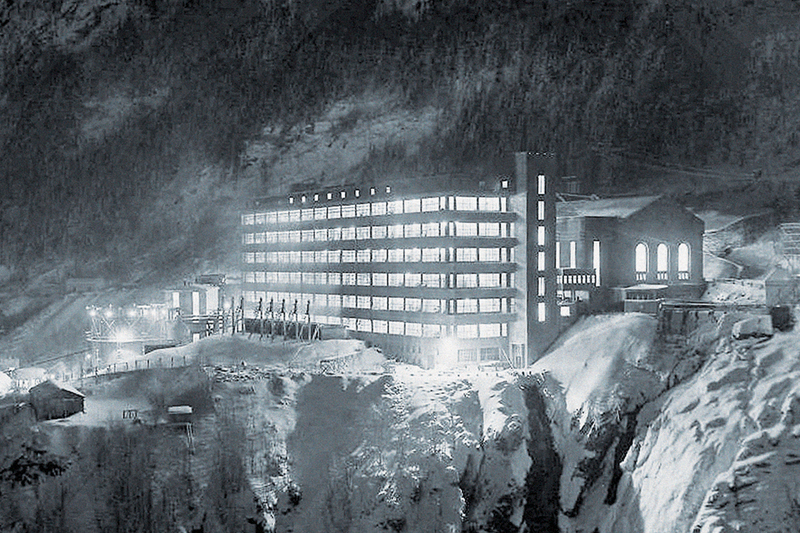 Today, the original power plant at Vemork is an industrial museum located near the town of Rjukan in the county of Telemark, but its importance dates back to before the Second World War when Norsk Hydro built the first commercial plant to produce fertilizer. A by-product of the process was the production of deuterium oxide, one of two substances necessary for moderating neutron energy emissions in a nuclear chain reaction (graphite being the other). Prior to Germany’s invasion of Norway in 1940 the extant supply of heavy water was removed by the French and, in turn, found its way to Britain after the Nazi invasion of France. But the plant in Norway was still capable of production. Understandably concerned that the Nazis would use the facility to produce heavy water for their own weapons programme, the Allies commenced a series of attempts to destroy the plant, or at least, stop its production. The SOE had a trusted agent, Einar Skinnarland, working within the plant, and he was able to pass detailed information to the British. Skinnarland was 24 years old and a graduate of the engineering college in Porsgrunn. He had made his way to Britain on board a coastal steamer and, coming from Telemark and having lived near the plant all his life, he had been a natural recruit for the Norwegian Independent Company 1, which had been set up in 1941 to carry out operations on behalf of the SOE. With members of his family already working within Vemork, it was relatively easy to insert Skinnarland back into the country and to find him work within the plant. At great personal risk to himself, he used his radio to pass valuable information to Britain, such as a detailed layout of the plant and working schedules within it, which could then be used for detailed planning by a demolition party. The first major attempt to destroy production took place in October 1942 when British Combined Operations mounted a raid to destroy the plant. Under Operation Grouse, a four-man team of Norwegian commandos were trained by the SOE and parachuted into Norway. Grouse was led by 23-year-old Second Lieutenant Jens-Anton Poulsson, and he and his three team members – Arne Kjelstrup, Knut Haugland and Claus Helberg – were all locally born and knew the area well. 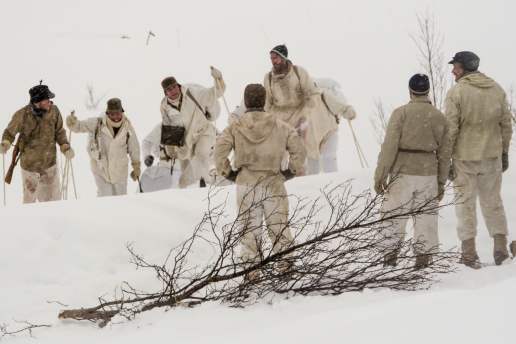 They were dropped onto the vast and mountainous Hardangervidda plateau in the central part of southern Norway as an advanced party for Operation Freshman, due to be mounted the following month by thirty British Royal Engineers of the 9th Field Company, 1st Airborne Division. The engineers were due to land in two Horsa gliders on a frozen lake near the plant, but although Grouse had gone much as planned, Operation Freshman proved to be a disaster. One of the gliders crashed after its Halifax tug flew into a mountain, killing all on board the Halifax and causing severe casualties on board the glider, while the second Halifax could not locate the landing site. It was decided to abort the operation and return to base, but the glider then broke free in bad weather and crashed, causing yet more casualties amongst those on board. Although there were some survivors from both of the gliders, they soon fell into German hands and were subsequently tortured by the Gestapo before being executed under Hitler’s Kommandobefehl. Not only was Freshman a failure, but it was now quite clear to the Germans that the Allies were determined to destroy the hydro-electric plant. The Allies knew this, but it was essential that another attempt be made. The Grouse team had survived and so it was now important for the men to remain undetected until a further attempt could be undertaken. For the four Norwegians high up on the plateau overlooking the plant it was a long winter, but they remained undetected until a fresh attempt could be made; they were now to operate under the changed codename of Swallow. On the night of 16 February 1943, under the codename of Operation Gunnerside, six Norwegian commandos, led by Joachim Rønneberg, boarded a converted Halifax bomber of 138 Squadron at RAF Tempsford. Rønneberg was another young Norwegian who had fled to Britain after the German occupation to join the Norwegian Independent Company. He was now 24 years old and a lieutenant, and was selected to lead the raid because of his steadiness and inspirational leadership qualities. He had been trained well and so had his team – Knut Haukelid, Fredrik Kayser, Kasper Idland, Hans Storhaug and Birger Strømsheim – all of whom had also fled their country after occupation, and were now equally determined to return home and hit back at their occupiers. They were all excellent skiers and fully at home in the mountains, and so were perfect for such a raid. Just hours later the Gunnerside team parachuted into Norway. They quickly gathered their supplies and set off to find the men of Swallow, but gale force winds and severe blizzards meant the conditions were harsh. Much of their time was spent sheltering in a remote hunting cabin and it took the team five days to travel the 30 miles to meet up with Swallow. Once together, the combined team began to make preparations for the raid, which was due to take place on the night of 27/28 February. The Germans had clearly expected the British to mount a further raid in the immediate aftermath of their failed attempt and so the defences at the hydro-electric plant had been significantly reinforced. The number of guards patrolling the facility and its surrounds had been increased, mines had been laid outside the plant and the whole area was covered by floodlights. Furthermore, the single bridge spanning the deep ravine above the main river providing water to the plant, which was the main route in and out of the facility, was heavily guarded. None of this was unexpected to the SOE and this was one of the main reasons behind the decision to leave the plant alone in the immediate aftermath of Op Freshman. Now, though, after more than three months, it was hoped that the German defenders had become more relaxed, complacent even, during what had been a long and extremely hard winter, even for the Norwegians. It was hoped that the bitterly cold weather would mean there would be a reduced number of guards outside the main plant, and even the guards who were outside would hopefully be more focused on trying to keep warm rather than maintaining a sharp lookout for intruders. To cross the river by using the main bridge was clearly out of the question and so the raiders decided to descend into the deep ravine. It was over 600 feet deep and the sides were steep. It was such a difficult route that the Germans had considered it impassable, but it was to prove the weak point of their defences. When the raiders reached the bottom they had to ford the icy river before climbing up the far side. Fortunately, the river level was low and they had been able to make good time. Having climbed back up the far side, the raiders then followed a railway track into the plant. The railway was rarely used, but even so, it came as a welcome surprise to find it unguarded; they were able to make their way into the plant without encountering any problems. From information provided by Skinnarland the raiders had been able to plan their attack in detail. The idea was to split into two teams, one to sabotage the plant while the other kept a lookout. It was around midnight when Rønneberg and Kayser crawled inside the building through a cable shaft. They found the room containing the heavy water cylinders guarded by just one person, a Norwegian. Apart from being caught by surprise, the guard turned out to be friendly and provided no opposition. Two more members of the team, including Strømsheim, soon joined them, having entered the building through a window. Remarkably, the team had been able to enter the plant without being spotted or encountering any opposition. They quickly set about placing their explosive charges on the heavy water electrolysis chambers and then attached a short delayed fuse to give them just enough time to make their escape. Before leaving, they placed a British Sten sub-machine gun next to the chambers to make it clear to the Germans that it was the work of the British and not the Norwegian Resistance, in the hope that this would prevent any reprisals against the local population. With the men having made their escape, the explosive charges detonated as planned, destroying the main electrolysis chambers. Although the noise was deafening inside the plant, outside the sound of the muffled explosion largely went unheard; although some guards seemed to hear the noise, they associated it with the sound of machinery in the plant rather than any act of sabotage. The heavy water had been destroyed, as had the equipment critical to the operation. The Germans dispatched a huge force to try and find the commandos but none were caught. Five of the team, led by Rønneberg, skied 250 miles to make their escape to Sweden; it took them two weeks. The rest stayed behind in Norway and simply disappeared back into the population without ever being found. The raid was, without doubt, a success. Eighteen heavy water cells and more than 1,000lb of heavy water had been destroyed, with the production of heavy water stopped for several weeks. However, the Germans fully intended to continue using the plant to restore production and, by the summer of 1943, the damage had been repaired and production fully restored. With German defences at the plant substantially increased, the Allies realized that mounting a further raid on the ground would most likely end up failing and prove too costly, and so a series of air raids were carried out instead. One daylight raid in particular, carried out by more than a hundred American B-17 bombers during November, caused extensive damage. The Germans were convinced that more air raids would hamper production and so decided to abandon the plant and transfer its heavy water production to Germany. This would involve moving the extant stock of heavy water and the critical components required for production. With five of the Gunnerside team having escaped to Sweden, the only trained commando still in the area was Knut Haukelid, who had remained behind in Norway. Haukelid was informed of the German plan to remove the stock of heavy water and its equipment across Lake Tinnsjø, one of the biggest lakes in Norway and one of the deepest in Europe, using the railway ferry operating on the lake. The ferry, called the Hydro, connected the railway on either side of the lake and carried raw materials and fertilizer from the hydro-electric plant to the port at Skien. While destroying the heavy water and equipment on the train was considered, there were too many uncertainties. Complete destruction could not be guaranteed and so the ferry presented the most obvious way of destroying the heavy water and its equipment. The Hydro simply had to be sunk. With the support of a small team, Haukelid put together a plan to sink the ferry as it crossed the deepest part of the lake, where it was nearly 1,500 feet deep. Unfortunately, the ferry also carried passengers and so, to minimize the number of civilian casualties, Haukelid was able to get someone on the inside of the plant to make sure the crossing of the lake took place on a Sunday when the ferry was known to carry fewest passengers. On Saturday, 19 February 1944, Haukelid received notice that the heavy water and equipment was due to be transported the following day, with the heavy water drums carried in railway cars. That evening, he and three saboteurs boarded the ferry. While one of the saboteurs, Knut Lier-Hansen, distracted a crew member, Haukelid and Rolf Sorlie went below deck to set the charge. It took them nearly two hours to set the 20lb of plastic explosive where it would do the most damage. The explosive was set in a circular pattern to blow out part of the hull and cause the ferry to sink quickly, but not so quickly as to prevent passengers and crew from escaping overboard. While the ferry needed to be sunk at the deepest part of the lake, Haukelid was also keen to ensure that the sinking took place close enough to the shore to give everyone the best possible chance of reaching safety. Having placed the charge, the saboteurs left the ship and Haukelid immediately set off for Sweden. The Hydro sailed as planned the following morning. It was a cold but calm day, but the peace and quiet of another Sunday morning on the lake was suddenly shattered as the explosive blew. The ferry immediately turned towards the shore, but the Hydro sank soon after with the loss of eighteen on board, including the crew of seven and eight German soldiers. The Hydro went straight to the bottom with the heavy water and vital equipment still on board. It would not reach Nazi Germany. There were many decorations awarded for the raid against the plant and the follow-on attack on the ferry. Amongst their own Norwegian decorations for bravery, both Joachim Rønneberg and Knut Haukelid were awarded the DSO by the British for their courage and leadership; Rønneberg for the Gunnerside team and Haukelid for the sinking of the Hydro. Other members of the team were awarded the MM and there was a DCM for Einar Skinnarland, who had provided such vital information from inside the plant. The heroism of those involved meant the top secret war against heavy water production became internationally known and the saboteurs rightly became national heroes.